He will unite the seven kingdoms. And he will sell a ton of toys in the process. He’s Arthur Curry, better known to the public as Aquaman. 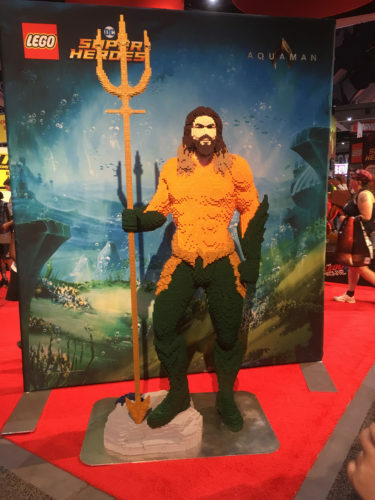 Half-human, half-Atlantean, he will wear the traditional orange chain mail of his comics incarnation, but most people are hoping he spends most of his film shirtless, for he is also Jason Momoa. And you do not cover Jason Momoa in orange chain mail for long. Aquaman, of course, arrives in U.S. movie theaters on December 21, but the media juggernaut hit San Diego on July 18. 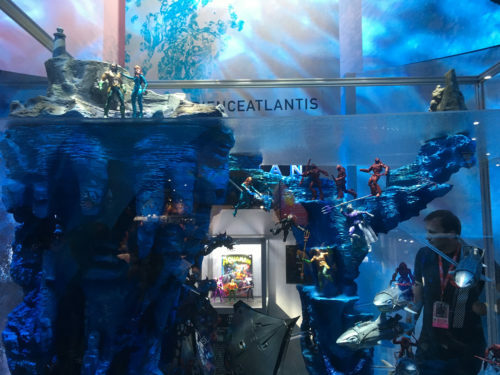 From the DC Entertainment booth to LEGO to the master toy license Mattel, there’s plenty of evidence for Aquaman being a better, broader story than years of Superfriends memories makes the general public think. Because let’s face it — though comics have been telling great Aquaman stories for years, that’s still a pretty small slice of pop culture consciousness. The film will have a bigger impact. 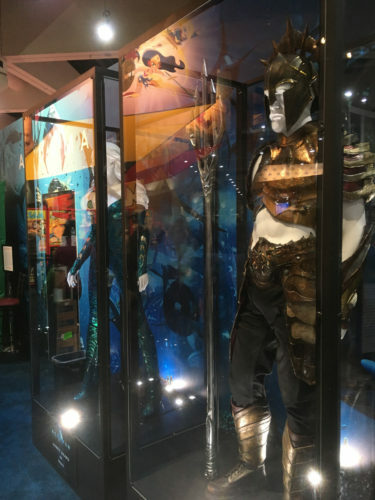 Starting with the DC Entertainment booth, two major costumes stand in display. 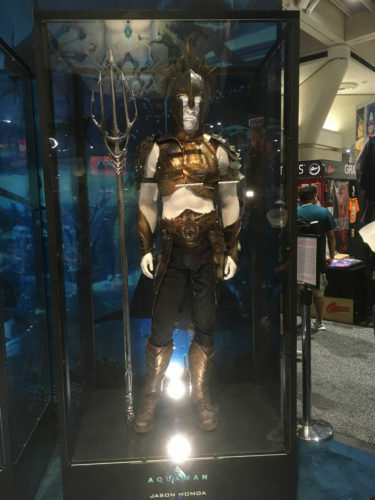 (That’s been a key element to the DC booth for years — movie and TV costumes to remind fans that they’ve got a major multimedia presence, while still emphasizing that it’s comics first.) 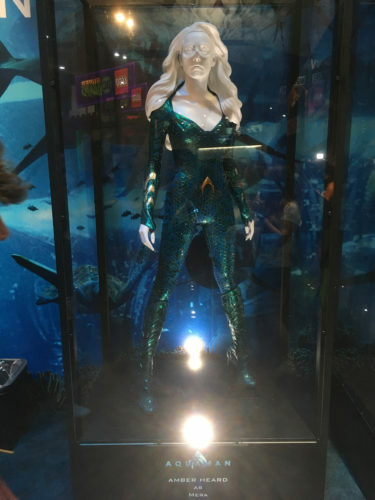 Amber Heard’s costume for Mera looks familiar, as it’s similar (if not identical) to the one she wore in Justice League. 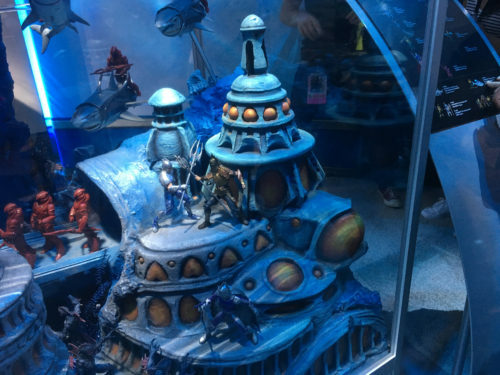 What we hadn’t seen from that film was Momoa in what looks like more traditional Atlantean armor — though the toy line clearly has him in a costume resembling his comic book appearance, this one reflects the occasional more “barbarian” look that he sported in the 90s. They were savage times. At this point, I must confess something: a couple of years ago, while competing in the Pro Fan Trivia Match against a team that included long-time Aquaman writer Paul Levitz, I expressed my excitement for an Aquaman movie. 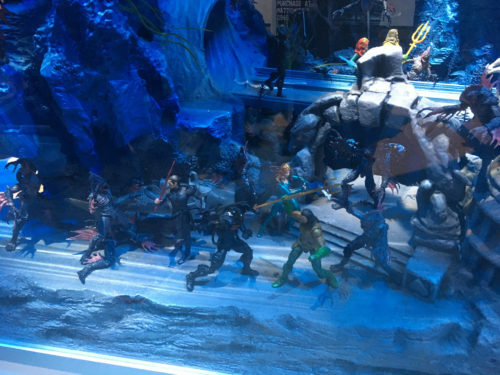 Levitz told me to “…get a life.” But truthfully, 7 year old me could not have imagined the kinds of toys for Aquaman that Mattel will be releasing this year. 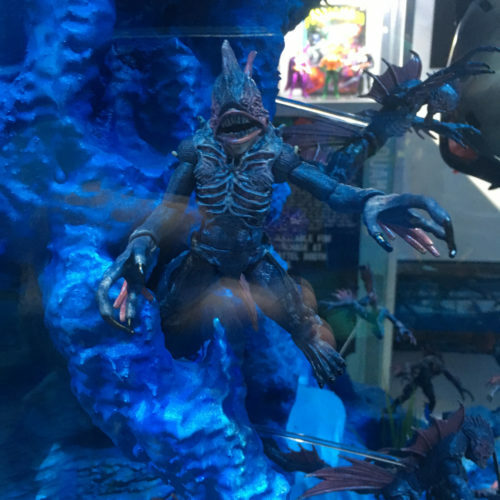 The closest I could get was a line called Sea Devils. 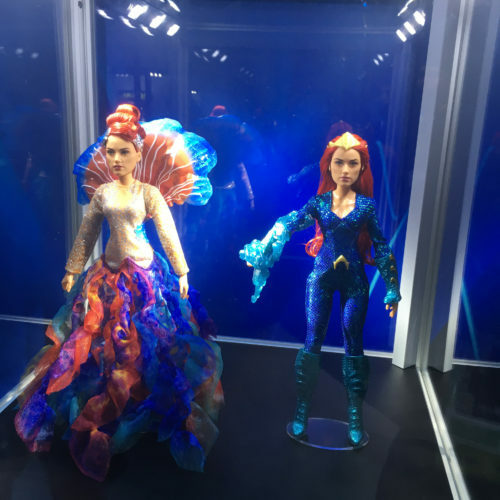 Of course, there are obligatory Barbie-like figures for Atlanna (Nicole Kidman) and Mera. 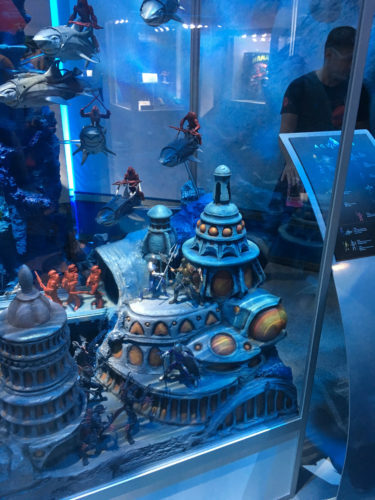 But both characters also have more straightforward action figures, which Mattel has placed on a beautiful diorama of Atlantis. I need a full playset like this. And a room to keep it in. 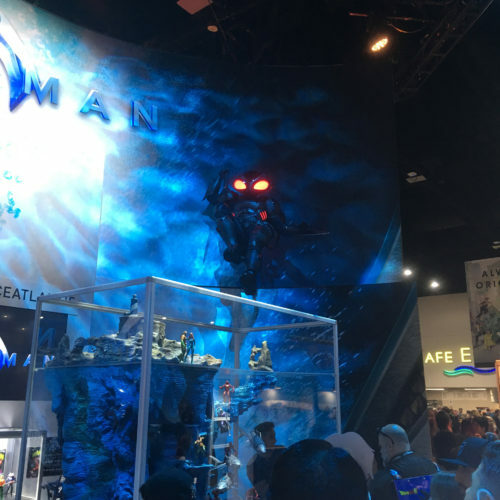 All of it is overlooked by an actual suit of armor worn by Black Manta (Yahya Abdul-Mateen II). 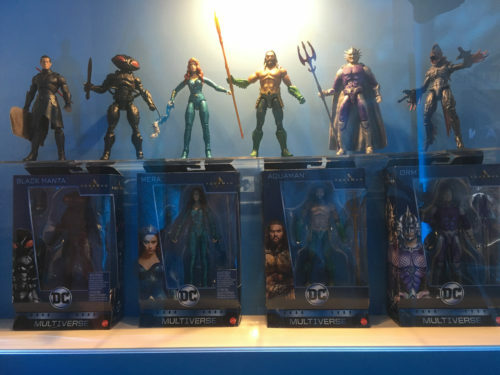 Let’s loop back to the DC Booth, where they promise more of a collectible. 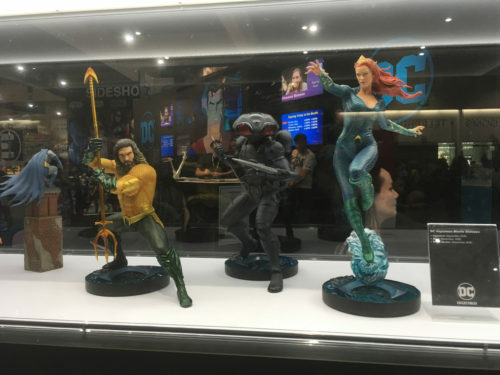 If action figures aren’t your speed, they’ll be offering beautiful statues to place on your shelf by your aquarium.